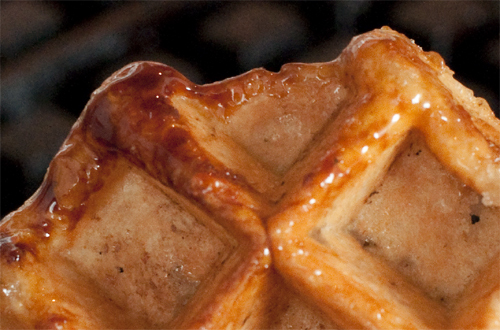 Authentic Liège waffles are one of life’s great indulgences — caramelized sugar glistening on the most delicious buttery-sweet, vanilla-laden treasure beneath. Unfortunately, they can be nearly impossible to find, even in their homeland of Belgium, where chains like Belgaufre have taken them so far afield from their 18th century brioche roots. Stateside, chains like Bonte (in Philadelphia) don’t use the right sugar and others like Wafels & Dinges (in NYC) simply import mass-produced substandard pre-made frozen balls of dough from Europe. 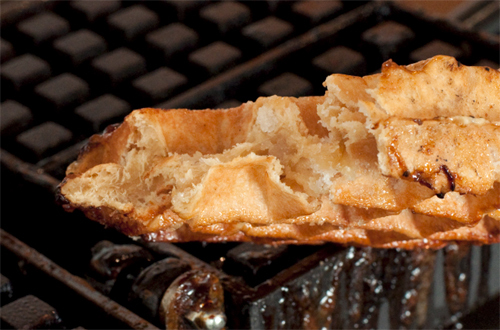 Basically, to enjoy the curiously oblong Liège waffle, you need to make one yourself. Sadly, the vast majority of recipes found online and in cookbooks are appallingly bad. Some are over-yeasted. Many are just leaden or grainy. 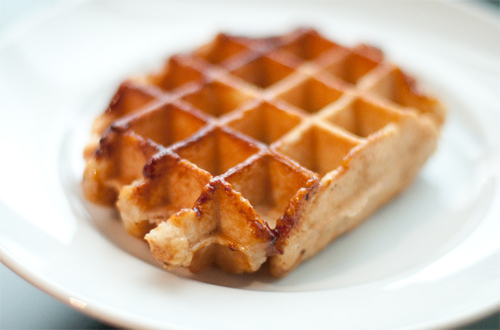 And, due to one factor or another, virtually all of them lack the smooth and complex flavors of a true Liège waffle. The recipe that follows is a culmination of A TON of research into recipes of the last 200+ years, study of artisanal Belgian street vendor techniques, and a heavy investment in the right tools (including the above 35lbs. Krampouz Liege waffle iron). Get ready to experience a traditional 18th century “Gaufre de Liège” — with some modern updates (e.g., a stand mixer and plastic wrap). And if you’re extra serious about using the perfect recipe, you can visit my latest metric version, which attempts to recreate the waffle with almost entirely period-correct ingredients. Baking these waffles is involved and takes patience, but the result is well worth it. The only caveat I must give is that the iron’s temperature is crucial in making an exceptional Liege waffle. It helps to have an infrared thermometer handy, as there’s a fairly narrow range in which the sugar will caramelize perfectly and not burn. You can make do without one though. It may take some trial and error, but you’ll get it right. 1. Place yeast, milk, and water into the workbowl of a stand mixer. Stir for a few seconds to moisten the yeast. 2. Add the egg and 2/3 of a cup of the flour. Mix to blend. Scrape down sides of bowl. 3. Sprinkle remaining 1 and 1/3 cups of flour over the mixture, but do not stir it in. Cover and let stand 75-90 minutes (at the end of that time, you’ll notice the batter bubbling up through the cover of flour). 4. Add the brown sugar and salt to the workbowl with the other ingredients. Mix on low speed (speed #2) – just to blend. 5. With machine on low, add honey and vanilla. Then add 2 Tbsp. of butter at a time. Mix 4 minutes at medium-low speed; scrape down sides once or twice in that period. Let the dough rest for 1 minute and then continue to mix for 2 minutes. If you measured your ingredients perfectly, the dough will be sticking to the sides of the bowl in the last minute of mixing and then, in the last 30 seconds of so, will start to ball-up on the paddle. If this does not happen, let the dough rest for 1 more minute and mix for another 2 minutes. 9. The next day, place the cold dough (it will be quite firm) in a large bowl and add all of the pearl sugar to a bowl. It will seem like a lot of sugar, but it’s supposed to be 🙂 Mix it into the dough by hand until the chunks are well-distrubuted. Once mixed, divide the dough into 5 pieces of equal size. 10. Shape each chunk into an oval ball (like a football without the pointy ends) and let it rise (covered loosely in plastic wrap) for 90 minutes. 11. If you have a professional waffle iron (meaning: it’s cast iron and weighs over 20 pounds) cook at exactly 365-370 degrees (the max temp before sugar begins to burn/decompose) for approximately 2 minutes. ** Give each waffle a few minutes to cool slightly before eating. No syrup or toppings are needed, unless you’d like to add some fruit or a dusting of powdered sugar; they’re quite sweet on their own.